8 First, I thank my God through Jesus Christ for all of you, because your faith is proclaimed in all the world. 9 For God is my witness, whom I serve with my spirit in the gospel of his Son, that without ceasing I mention you 10 always in my prayers, asking that somehow by God's will I may now at last succeed in coming to you. 11 For I long to see you, that I may impart to you some spiritual gift to strengthen you— 12 that is, that we may be mutually encouraged by each other's faith, both yours and mine. 13 I want you to know, brothers, that I have often intended to come to you (but thus far have been prevented), in order that I may reap some harvest among you as well as among the rest of the Gentiles. 14 I am under obligation both to Greeks and to barbarians, both to the wise and to the foolish. 15 So I am eager to preach the gospel to you also who are in Rome. 1And the chief fathers of the families of the children of Gilead, the son of Machir, the son of Manasseh, of the families of the sons of Joseph, came near, and spake before Moses, and before the princes, the chief fathers of the children of Israel:2And they said, The LORD commanded my lord to give the land for an inheritance by lot to the children of Israel: and my lord was commanded by the LORD to give the inheritance of Zelophehad our brother unto his daughters.3And if they be married to any of the sons of the other tribes of the children of Israel, then shall their inheritance be taken from the inheritance of our fathers, and shall be put to the inheritance of the tribe whereunto they are received: so shall it be taken from the lot of our inheritance.4And when the jubile of the children of Israel shall be, then shall their inheritance be put unto the inheritance of the tribe whereunto they are received: so shall their inheritance be taken away from the inheritance of the tribe of our fathers.5And Moses commanded the children of Israel according to the word of the LORD, saying, The tribe of the sons of Joseph hath said well.6This is the thing which the LORD doth command concerning the daughters of Zelophehad, saying, Let them marry to whom they think best; only to the family of the tribe of their father shall they marry.7So shall not the inheritance of the children of Israel remove from tribe to tribe: for every one of the children of Israel shall keep himself to the inheritance of the tribe of his fathers.8And every daughter, that possesseth an inheritance in any tribe of the children of Israel, shall be wife unto one of the family of the tribe of her father, that the children of Israel may enjoy every man the inheritance of his fathers.9Neither shall the inheritance remove from one tribe to another tribe; but every one of the tribes of the children of Israel shall keep himself to his own inheritance.10Even as the LORD commanded Moses, so did the daughters of Zelophehad:11For Mahlah, Tirzah, and Hoglah, and Milcah, and Noah, the daughters of Zelophehad, were married unto their father's brothers' sons:12And they were married into the families of the sons of Manasseh the son of Joseph, and their inheritance remained in the tribe of the family of their father.13These are the commandments and the judgments, which the LORD commanded by the hand of Moses unto the children of Israel in the plains of Moab by Jordan near Jericho. 1These be the words which Moses spake unto all Israel on this side Jordan in the wilderness, in the plain over against the Red sea, between Paran, and Tophel, and Laban, and Hazeroth, and Dizahab.2(There are eleven days' journey from Horeb by the way of mount Seir unto Kadeshbarnea. )3And it came to pass in the fortieth year, in the eleventh month, on the first day of the month, that Moses spake unto the children of Israel, according unto all that the LORD had given him in commandment unto them;4After he had slain Sihon the king of the Amorites, which dwelt in Heshbon, and Og the king of Bashan, which dwelt at Astaroth in Edrei:5On this side Jordan, in the land of Moab, began Moses to declare this law, saying,6The LORD our God spake unto us in Horeb, saying, Ye have dwelt long enough in this mount:7Turn you, and take your journey, and go to the mount of the Amorites, and unto all the places nigh thereunto, in the plain, in the hills, and in the vale, and in the south, and by the sea side, to the land of the Canaanites, and unto Lebanon, unto the great river, the river Euphrates.8Behold, I have set the land before you: go in and possess the land which the LORD sware unto your fathers, Abraham, Isaac, and Jacob, to give unto them and to their seed after them.9And I spake unto you at that time, saying, I am not able to bear you myself alone:10The LORD your God hath multiplied you, and, behold, ye are this day as the stars of heaven for multitude.11(The LORD God of your fathers make you a thousand times so many more as ye are, and bless you, as he hath promised you! )12How can I myself alone bear your cumbrance, and your burden, and your strife?13Take you wise men, and understanding, and known among your tribes, and I will make them rulers over you.14And ye answered me, and said, The thing which thou hast spoken is good for us to do.15So I took the chief of your tribes, wise men, and known, and made them heads over you, captains over thousands, and captains over hundreds, and captains over fifties, and captains over tens, and officers among your tribes.16And I charged your judges at that time, saying, Hear the causes between your brethren, and judge righteously between every man and his brother, and the stranger that is with him.17Ye shall not respect persons in judgment; but ye shall hear the small as well as the great; ye shall not be afraid of the face of man; for the judgment is God's: and the cause that is too hard for you, bring it unto me, and I will hear it.18And I commanded you at that time all the things which ye should do. 1Paul, a servant of Jesus Christ, called to be an apostle, separated unto the gospel of God,2(Which he had promised afore by his prophets in the holy scriptures,)3Concerning his Son Jesus Christ our Lord, which was made of the seed of David according to the flesh;4And declared to be the Son of God with power, according to the spirit of holiness, by the resurrection from the dead:5By whom we have received grace and apostleship, for obedience to the faith among all nations, for his name:6Among whom are ye also the called of Jesus Christ:7To all that be in Rome, beloved of God, called to be saints: Grace to you and peace from God our Father, and the Lord Jesus Christ.8First, I thank my God through Jesus Christ for you all, that your faith is spoken of throughout the whole world.9For God is my witness, whom I serve with my spirit in the gospel of his Son, that without ceasing I make mention of you always in my prayers;10Making request, if by any means now at length I might have a prosperous journey by the will of God to come unto you.11For I long to see you, that I may impart unto you some spiritual gift, to the end ye may be established;12That is, that I may be comforted together with you by the mutual faith both of you and me.13Now I would not have you ignorant, brethren, that oftentimes I purposed to come unto you, (but was let hitherto,) that I might have some fruit among you also, even as among other Gentiles.14I am debtor both to the Greeks, and to the Barbarians; both to the wise, and to the unwise.15So, as much as in me is, I am ready to preach the gospel to you that are at Rome also.16For I am not ashamed of the gospel of Christ: for it is the power of God unto salvation to every one that believeth; to the Jew first, and also to the Greek.17For therein is the righteousness of God revealed from faith to faith: as it is written, The just shall live by faith. 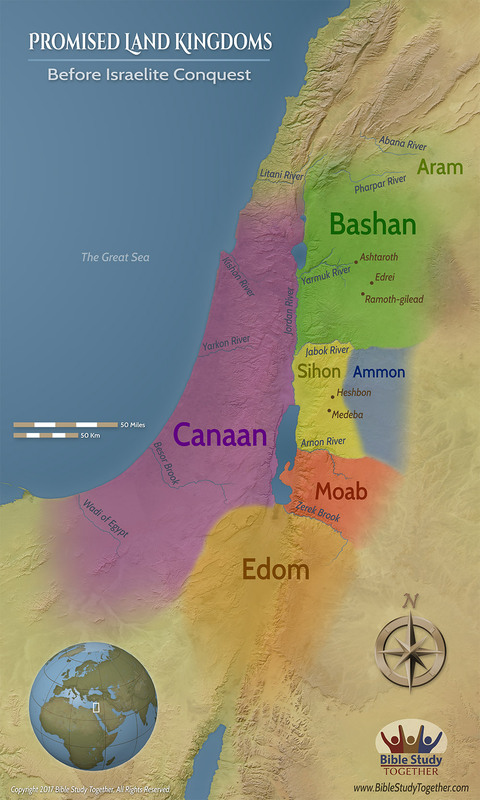 How did God keep the inheritance within each tribe? Why did Paul receive grace and apostleship? How do we mutually encourage and comfort each other? Why shouldn’t you be ashamed of the Gospel? Encourage someone who has encouraged you today.